As I have mentioned time and time again, it’s really easy to turn desserts into fun edible art. After all, you can sculpt fondant into just about anything, so toss it on a cake and suddenly, you’ve become super artsy. It takes talent to create those masterpieces, no doubt, the you really don’t have to think too far outside the box to morph fondant into a known creature or object. To turn otherwise existing foods into something cohesive and still entirely edible takes a different kind of thought process entirely. Throw in some picky eaters and well…good luck. Ha! The mom who created the above rainbow snack somehow managed to come up with a creation that her son both helped make and loved (mostly! )….and it was healthy, at that! 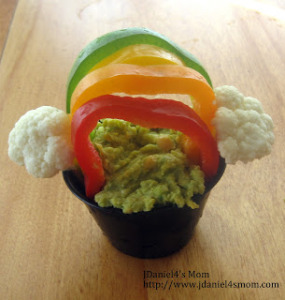 I know a lot of adults who wouldn’t touch something called “spinach artichoke hummus,” so hats off to this mom….even if her son still didn’t like eating the rainbow arch peppers. If you happen to be hosting a St. Patrick’s Day gathering of any sort, I think these would be a hit compared to a lame veggie tray, too.